Schools and sports organizations frequently use one schedule table or slider to display the games for all their teams. This feature is supported in both the schedule tables and schedule sliders as described below. Create a schedule for each team. 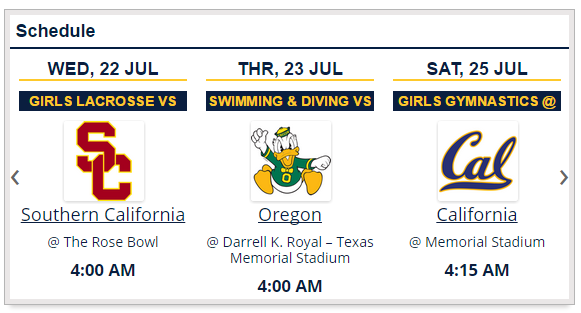 Add games to each team’s schedule. Create a shortcode with all the teams on it as shown above. There is no display setting to do this. The shortcode argument, show_sport must be set. Create the teams; for example, Baseball, Softball, Track & Field, etc. Create a schedule for each team. Choose the schedule names carefully, they will appear on the front end. For example, Boys Basketball, Girls Lacrosse, Football, Track & Field etc. There is no display setting to do this. The shortcode argument, show_schedule_name must be set.